This layout came about because of the Dave Brewer Memorial Challenge at the 2011 EXPO-NG show, which was to build a layout in a box-file. For those outside the UK, a box-file is a stationery box a little larger than an A4 sheet of paper and about 75mm deep, the base and lid are stiff card but I found the sides are made from a thin chipboard. The rules stated the lid of the box-file must be able to close, although scenary, buildings etc be removable to allow this and the front could fold down. A removable "stick" could be added as a head-shunt/fiddle yard. Now I am a bit of a sucker for these type of competitions having done two before, Southon Yard and Pen-Y-Bryn Quarry. I do enjoy the challenge of designing an interesting, plausible, and realistic layout in a small space, which is just as well as I don't have a large space! However the catalyst was a desire to have a go at modelling in 014, I've been attracted to the Roy Link (now KBScale) range of products for industrial 2ft gauge since my teenage years, and this felt like a great excuse and a test-bed for the change of scale. 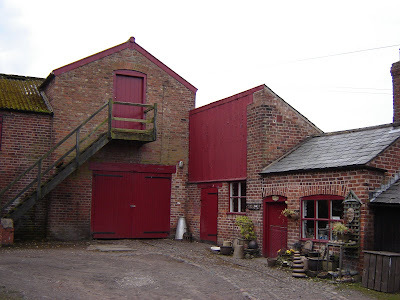 But many industrial lines had pretty dull operation, and operated on large sites, so what would make an interesting subject in such a tiny space? 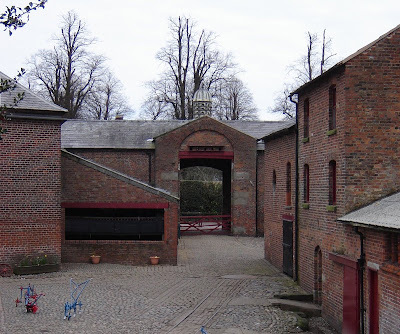 Tatton Park Farm in Cheshire - note the rails in the cobbles! The Inspiration for this layout had come a couple of years previously on a visit to the farm at Tatton Park in Cheshire, where I came across rails in the cobbles. They did not go beyond the farmyard and were never loco-worked, but other farms and estates used narrow gauge railways - there were dozens serving the potato farms of Lincolnshire, and several estate railways of various gauges 2ft and under. Some did use locomotives, the miniature gauge estate "novelties" tended to steam but the real working lines adopted the cheaper internal-combustion locos that became available after the first world war. I liked the idea of a railway in a farmyard, as part of a larger estate system, and thought that it would provide an interesting variety of traffic as well as working visually in a small space. The History: The Duke of Landswood ran his estate in Cheshire using the most modern methods, so in the late 19th century a hand-worked railway was installed at the Home Farm. After the Great War there was a shortage of horses, but the farm manager had seen the 2-foot gauge railways that served the trenches. Therefore War Dept surplus track and stock was bought, the railway extended to the nearby station and other parts of the estate, and an internal combustion locomotive was introduced. This proved effective for many types of traffic on the estate, and further stock obtained from industrial suppliers as the WD equipment wore out. ﻿The Reality: The layout was planned full-size in the box-file using paper track templates, buildings were mocked up with packaging card until I had a design that worked. Holes were cut in the end of the file for tracks to exit to a plasticard "cassette", and the front cut away to hinge down. The track was hand-built using code 80 rail on PCB strip sleepers, the first time I had made my own track so I was pleasantly surprised to find it worked. The points are controlled by wire-in-tube from slide switches accessed through a hole in the end of the box. Power is DC using my usual set-up. The buildings were scratch-built using Slater's Plasticard, and wooden coffee stirrers. My Mum painted the back-scene, including the removable end-pieces I'd made to hold the lid open, and I added a tree made from wire. A critical part of the farmyard look was the cobbled yard, I used DAS clay for this fitted in around the rails, with the cobbles and setts embossed while the clay was damp. The detailing was used to emphasise the farmyard environment, including pigs and chickens, straw and manure, as well as signs of traffic such as coal and feed sacks. I've aimed for a consistent and lightly weathered colouring of the scene. This being my first layout in 014, it wasn't just the layout I had to build but the loco and all the stock too. The Lister seemed ideal for an agricultural line, and I love it's tiny and unusual form, it was built from a brass kit from KB Scale. The wagons are plastic kits from KB Scale too, and are all based on the Hudson Rugga skip chassis, although I have introduced as much variety as possible. They carry appropriate loads too, which add visual and operational interest, the track forming an "Inglenook" it is possible to operate it as a shunting puzzle. I have used Microtrains N-gauge Buckeye couplers, which operate automatically with uncoupling magnets set under the clay. The Lister is a KBScale kit, it runs very slowly! The entire project - layout, loco and stock - was built in just 8 months, and while it has challenged me with new skills it has been great fun, and an ideal test-bed to try out a new scale. I am really pleased with the result, it has to my eyes the atmosphere I was aiming for, it is even satisfying to operate despite it's tiny size, and the feedback from EXPO was that the viewers liked it too. The judges of the challenge must have thought so too, and I was honoured to receive the first prize! The Layout on display at EXPO-NG 2011. The flourescent lamp (from IKEA) was bought to provide illumination, and a simple stand made up from wood to raise the layout up a little.